The TDSB has a number of policies and procedures in place to identify and prevent improper professional activities. To complement these policies and procedures and ensure protection against reprisals related to the reporting of suspected wrongdoing, the TDSB has introduced a reporting system that can be used by anyone to raise concerns about suspected wrongdoing by an employee of the TDSB. What types of activities should be reported? Who can report suspected wrongdoing? 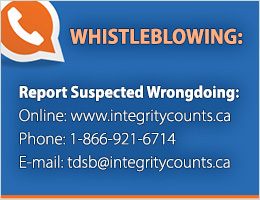 Anyone can report suspected wrongdoing by an employee of the TDSB through the reporting system, including trustees, employees, permit holders, volunteers, students, parents/guardians and the general public. How can a report be submitted? Reports can be submitted online, by phone or by email. If a written report is being submitted, please use the Reporting Suspected Wrongdoing form to ensure that the report contains sufficient detail and information so the concern can be investigated appropriately. The reporting system is managed by a third party organization called Integrity Counts. For more information about submitting a report, please see Incident Reporting How-to Guide. A report of suspected wrongdoing may be made anonymously. However, the investigation will be most effective if your contact information is provided in the report. If you provide your contact information, rest assured that the process has been designed to protect your identity. Anonymous allegations will only be acted upon if the evidence collected during the preliminary investigation indicates the disclosure can be properly investigated and is in the public interest. Please ensure that sufficient information is provided, especially if you submit an anonymous report.